With the debut of the new game Assignment 53, Alien Aishas are on all of our minds. But how much do we actually know about them? Well, let's see. They have a complex system of vending machines, they love Gross Food, they're crafty enough to come up with the Aisha Myriad, and... er... hmm. That's really all we know, isn't it? But don't worry. With the help of some Alien Aisha sources who wish to remain anonymous, I've been able to learn more about these mysterious interstellar travelers. Here are ten little-known facts about Alien Aishas that might just make you wish you had six ears. 1. Alien Aishas come in several colors. While green is by far the most common, yellow, blue, red, pink, purple, and orange Alien Aishas also reside on the Alien Aisha mothership. Purple and orange Alien Aishas are much lighter in color than their Neopian counterparts, however. "There might be other colors back on the home planet," one source admitted doubtfully, "but in all my years working on the mothership, I never saw any but those." So if you see a white Alien Aisha, it's most likely someone trying to play a prank on you! 2. Alien Aishas pass names down through families, but not the way we usually do on Neopia. According to my sources, a name can only be passed on from one Aisha to an Aisha of the opposite gender. So an Alien Aisha girl might be named after her father or uncle, but never her mother or her aunt. Sophix II serves as an excellent example: she's named after her grandfather, the famed Sophix, who made key improvements to Anti-Gravity Boots. Arlhox VII, supreme Alien Aisha commander, is named after his great-aunt, a princess I'm told was known equally for her delicious Eyeball Pie and her tendency to make her enemies sick with inventive poisons. 3. It won't surprise you to learn that Alien Aishas have truly excellent hearing. With their four flexible earstalks, Alien Aishas can pinpoint the exact location a sound is coming from, as well as detect very soft sounds. This is one reason why Farvin III is an excellent Gormball player--he can hear the Gormball churning just before it pops. Alien Aishas can also hear things four times as far away as regular Aishas. And get this: their incredible hearing allows them to communicate at high pitches most Neopets can't even hear! That means two Alien Aishas could carry on a conversation right in front of you without you even noticing. 5. You may have wondered about the triangular marks some Alien Aishas have on their foreheads. Some point up, some point down, and sometimes Alien Aishas don't have them at all. So what are they? According to my highest-ranking source, the marks indicate Alien Aisha rank. New recruits to the Alien Aisha Force start out with no mark at all. When the recruits graduate from training, they're marked with a triangle. Depending on the department they're assigned to, the triangle will point up or down. Confusingly enough, the highest-ranking Alien Aishas often have their marks removed! You'll notice that Captain Xelqued has no triangle, for example. This can make for some awkward small talk at parties, where you might mistake an inexperienced newbie for a seasoned explorer. 6. Alien Aishas possess technological know-how to rival Dr. Sloth's, which is how they explore so many new planets. But in addition to useful technology like Anti-Gravity Boots, Alien Aishas also create a lot of useless technology. One of my sources described ten different kinds of mechanical toothbrushes, each designed to brush your teeth in a different pattern. Another mentioned a device programmed specifically to polish left shoes (and only left shoes). Each year, the Alien Aishas on the mothership hold a contest to see who can invent the most useless piece of technology yet. The winner last year? A machine whose sole purpose is to make clothing out of condiments. 7. Alien Aishas don't actually need to wear their space helmets on Neopia, as they can breathe the air just fine. This is why you sometimes see Alien Aishas wearing helmets with eyeholes cut out. It would be simpler to remove the helmets, of course, but many Alien Aishas attach a sentimental value to their helmets, which remind them of home, and they do not wish to part with them entirely. 8. Ever ask yourself why the Alien Aisha Vending Machine in the Plaza only accepts Nerkmids? Simple: Nerkmids serve as currency to Alien Aishas. 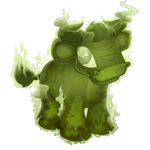 Offer an Alien Aisha a Neopoint and you'll be met with an expression of confusion, as they have no use for them. Nerkmids are minted from metal that Alien Aishas discover on uninhabited planets, and are marked according to their value with symbols, like Neopoints. 9. Alien Aishas have petpets just like Neopets. Well, maybe not just like. Most of the petpets owned by Alien Aishas are descended from the smaller inhabitants of hostile planets. Where do you think Charnies and Wains originally came from? Some of these petpets can get out of hand, but others are very gentle. Mibblies and Tencals are popular petpets for young Alien Aishas. 10. All right, here's the question you've been waiting for. How in Fyora's name can Alien Aishas actually enjoy the Gross Food they vend? It took me a while to find out the answer, since all of my sources seemed bewildered to learn that Neopets think Gross Food is, well, gross. "What do you mean? Ketchup Ice Cream tastes so much more flavorful than that boring stuff you call ice cream... "
After some testing, the reason for this attitude became clear. Alien Aishas actually have special taste receptors on their tongues which change the taste of Gross Food. What to us tastes disgusting tastes delicious to them, because their bodies are designed that way. So next time you turn your nose up at a Minced Beef Pretzel from the Vending Machine, don't blame the Alien Aishas who made it. To them, it tastes perfect. And there you have it: ten fascinating facts about our extraordinary extraterrestrial neighbors! I hope you find them as illuminating as I did. But while this article may remove some of the mystery surrounding Alien Aishas, many questions still remain. Where, for example, is the Alien Aisha home planet, and what is it like? I tried to ask my sources, but they refused to reveal any details. And what is the Alien Aisha Invasion Force actually trying to invade? Do we Neopians need to be prepared to protect our homes? I suppose we'll just have to wait to find out the answers to those questions. In the meantime, you can play Assignment 53 to find out what a typical day is like for an Alien Aisha in the field. Have fun, and good luck with your Nerkmids! Everyone has their household contributions to make. Most carefully plan their pet's dip in those magical waters centered in Neopia Central. Well, my girl may have slipped. That is the current hypothesis, anyway.